Saint John Island is one of the most remote places within the United States. 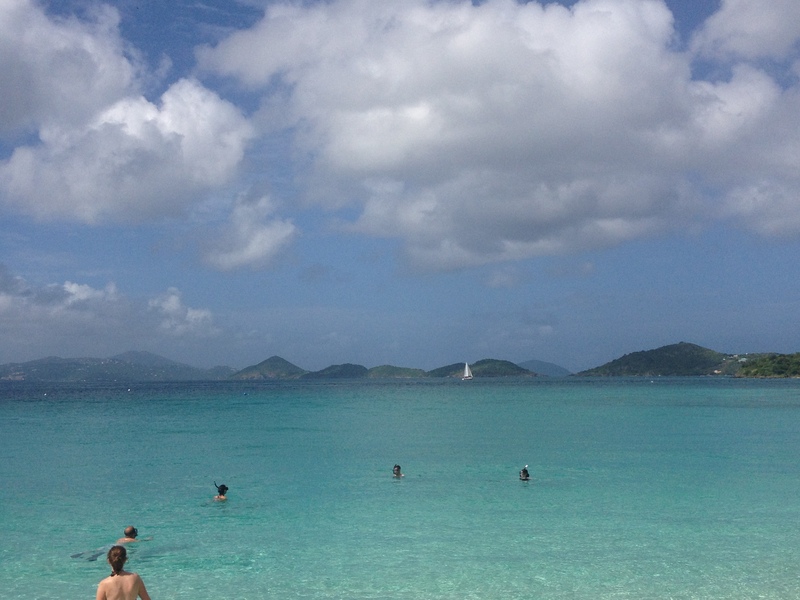 A part of the United States Virgin Islands territory, it’s year-round population is a meager 4200 people. It can only be accessed via ferry or boat. For mainlanders, Saint John can be accessed by a 20 minute ferry ride, after a half hour cab ride from the airport on nearby Saint Thomas. The flying time to Saint Thomas is listed as roughly three hours from the nearest major airport in the mainland; Miami, Florida. Therefore, the minimum travel time for any mainlander is four hours. For most, the journey is much longer. 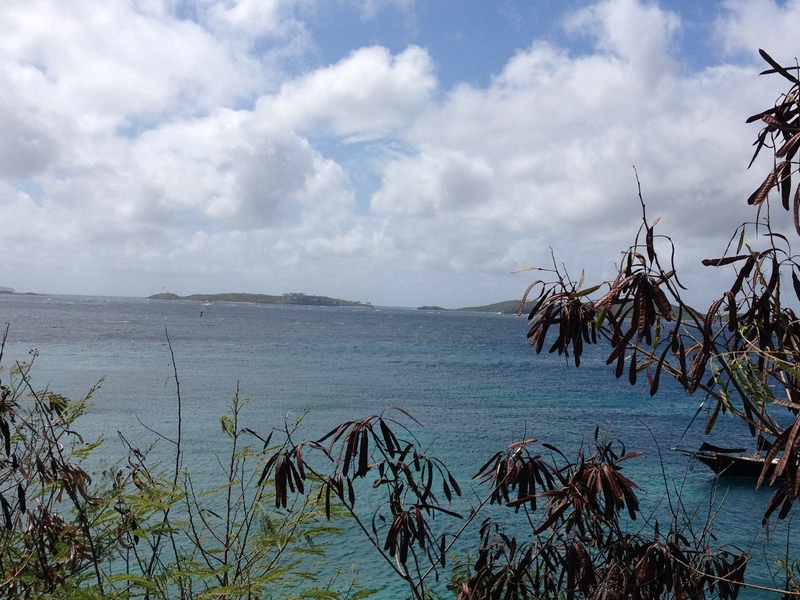 I spent my time on Saint John primarily in two places; Cruz Bay, which is the main population center on the island, and Caneel Bay, a resort about ten minutes farther up the coast of the island. Cruz Bay is where the ferry from Saint Thomas first arrives. It is the first place any visitor to this island sees. It is Saint John’s front door, it’s first impression. And it doesn’t disappoint. The ocean here is as stunning and picturesque as anywhere I could possibly imagine. In fact, even at some of the best kept lakes in the United States, I have never seen water this magically blue. 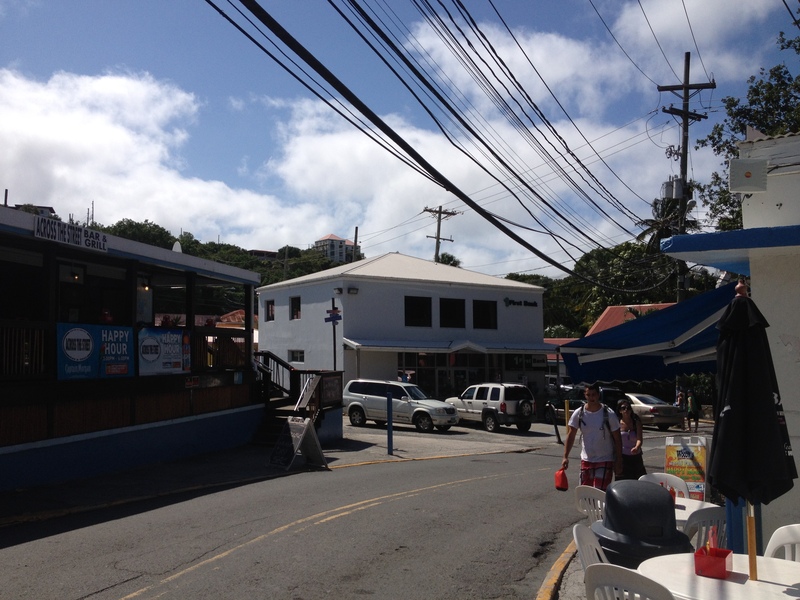 Upon arrival to Cruz Bay on the ferry, one immediately sees a plethora of tourist accommodations. 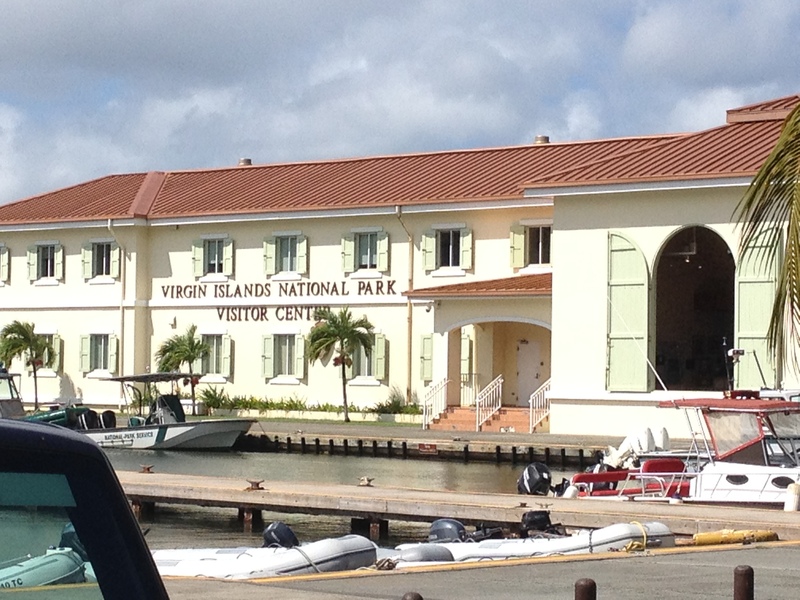 To the left is the Virgin Islands National Park Visitor Center. In front are the beaches, boats and restaurants. A tourist that walks up the road straight in front of them (road names are not obvious here) will encounter a road lined with bars and restaurants that obviously cater to those not from the Islands. 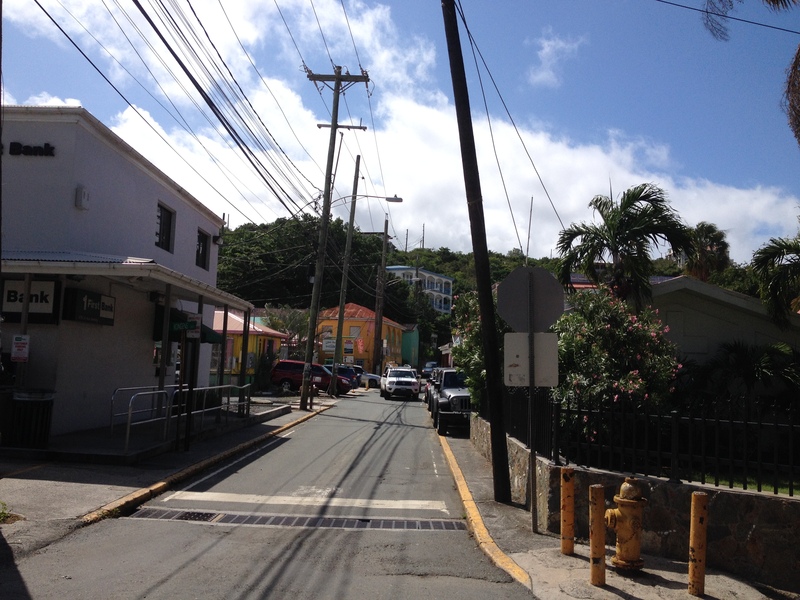 Walking along this street in the evening, rather than traditional Caribbean music, one will hear the likes of Jimmy Buffet, modern American pop, and a surprising amount of Country-Western music. And, a vast majority of the proprietors and patrons of any of these restaurants are obviously tourists or those who moved here from the mainland to work tourism related jobs. Most of the residents of this island are black (or Afro-Caribbean). Although this did not really surprise me, I still wonder how this came to be, as I had never really been taught about the history of the Caribbean Islands beyond the arrival of Christopher Columbus in 1492 and the subsequent voyages to the “New World” that the news of this voyage inspired. However, when I look around me, and take a couple of trips to less touristy parts of the Island, where one can see a better representation of how those native to Saint John live, I can’t help but have the present rather than the past on my mind. How do the lives of those that live here year round differ from our own? How do they feel about being a part of the United States? And, more specifically, how do they feel about their status as a U.S. territory (and not a state)? We commonly hear about issues regarding Puerto Rico’s similar status, and the razor thin margin between those who support and those who oppose statehood. But, we never really hear much about the U.S. Virgin Islands’ status and how it impacts the people here. Most importantly, how do they feel about us, and our presence here? Do they debate the economic impact of tourism vs. the cultural disruption that it causes? Do they ponder the fact that within the mainland part of the U.S., we have places like Catalina, Key West and South Padre, places where many of us could theoretically get a similar experience without invading their island? Ultimately, are they fighting for their identities, their culture, or are they enjoying the economic benefit of our presence, as well as their association with the United States of America? When we think of the Caribbean, we often think of pop icons, including Bob Marley, but also more recent pop icons from the region, such as Daddy Yankee and Sean Kingston. The music produced by these artists take us to the pristine tropical oceans of the Caribbean, if nowhere else but in our minds. However, it is these pop icons that appear to represent the dichotomy of the possible responses that seem plausible given the current situation of those that live in the U.S. Virgin Islands. Marley, from his lyrics, considered himself part of a struggle for the culture and identity of himself and his people. But modern pop stars like Kingston appear to be simply enjoying the economic benefit of their stardom, much of which comes from the U.S. and the western world that Marley rallies against. Although there is a lot more to any one person’s life that what we witness through the media, Kingston and Co. do appear to be thoroughly enjoying their lives. 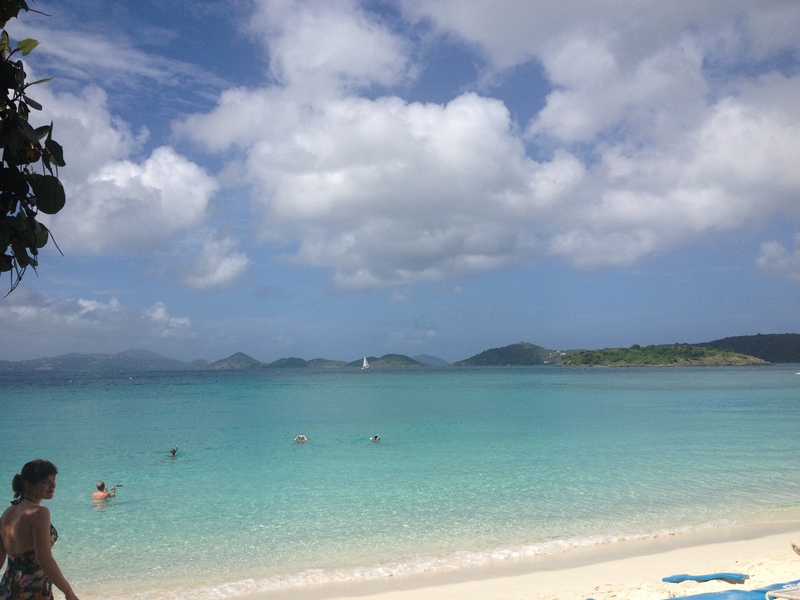 After multiple nights of partying, I lay exhausted on Scott Beach, the finest beach on Caneel Bay resort. I watch the boaters and snorkelers go by. Some even tell me that it was here, in the clear waters of the Caribbean, that they had one of the best snorkeling experiences of their lives. They did so by being willing to visit a place a little bit out of the way, a place where the people, the culture, and the way of life are different than their own. That is when it occurred to me that the world is full of people who are different from me. The world is full of people who look different, act different, have different customs, beliefs, values, and different ways of understanding the world. We can either learn to live with different types of people, and try to relate to them as best as we can, or we can accept the limitations that go along with confining ourselves to people with sufficient similarities to ourselves. In practice, we all implore somewhat of a combination of the two strategies; accepting some differences but trying to stay away from others. However, there are some that believe that in an increasingly connected world, the future belongs to those that can bridge the gap between different cultures. I am not sure if I inherently believe that the ability to bridge cultural gaps is a prerequisite for success in the 21st Century, as many people have built fortunes designing products that largely cater to one segment of society. However, when I watch people enjoy Saint John Island, and watch videos by Kingston and other similar artists, I see firsthand the benefits of being able to relate to those with different backgrounds and ways than my own. This entry was posted in beaches, Caribbean, culture, Oceans, psychology, snorkeling, tourism, Virgin Islands, Water Sports and tagged beaches, Caneel Bay, Caribbean, Cruz Bay, culture, Saint John, tourism, travel on November 12, 2014 by Stephen Jaye.